Anti-war protests have disrupted traffic in the centres of Scotland's two largest cities. 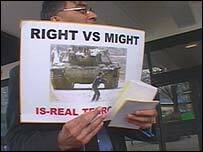 The demonstrations in Glasgow and Edinburgh came after the start of military action against Iraq. Stirling University was also closed by a rally, and Lerwick, Dundee, Inverness and Aberdeen also saw protests on Thursday. In Edinburgh, about 500 people marched down to the foot of The Mound at lunchtime for an impromptu rally which was addressed by MSPs Tommy Sheridan and Lloyd Quinan. The protest, which mainly involved school children and young adults, closed parts of Princes Street and The Mound to traffic. Police made several arrests and criticised organisers for failing to agree on a plan or a route for the march. 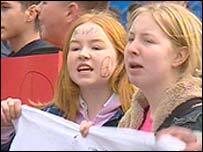 Later in the day about 3,000 campaigners paraded up the Royal Mile to take their anti-war message to the Scottish Parliament. Those taking part included school pupils, student groups, Labour Party branches, Socialist and Green Party members and supporters of a free Palestine. At the same time about 1,000 protesters brought Glasgow city centre to a virtual standstill. 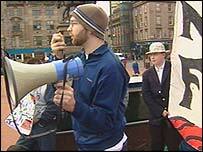 Traffic was disrupted by a number of sit-down protests on roads around George Square. About 200 protesters also blocked rush-hour traffic trying to join the M8 motorway at the Charing Cross junction, just north of the Kingston Bridge. About 50 students from Glasgow University had earlier stopped traffic at a busy junction on the city's Byres Road. Stirling University was brought to a standstill when 1500 staff and students joined a mass rally against military action. The speakers included Professor Colin Bell, the university's principal. Speaking in a personal capacity, he said the university was concerned because of its many overseas students, including Kuwaitis, a significant number of Muslim students and a large number of Americans. He said that the university would continue to encourage open conversation and dialogue. A spokesperson for the Stirling University Stop The War group said: "This campaign against this war has involved students, academic and support staff in an unprecedented way. "It has brought together the largest, most diverse group ever to engage in political activity in the Stirling campus. "This reflects the wider campaign opposed to the war which has involved people from a wide range of political perspectives and has included traditional activists as well as those who have never taken any political action." In Aberdeen, there were 11 arrests as 300 people joined a protest in St Nicholas Street. A number of medical staff at Aberdeen Royal Infirmary staged their own protest, handing out anti-war leaflets to patients, visitors and colleagues outside the hospital. Meanwhile, a group of 60 law experts from across Scotland has claimed that the military action in the Gulf has no basis in international law. The academics called on the Scottish Parliament to "express its grave concern" about the attack on Iraq. "More demonstrations are planned around the country"